Birthing ball is one of the great tools for you during pregnancy and birth. It can assist you in so many ways you didn’t even think of before. Actually it’s one of the most important things you should have during your pregnancy. If you are reading this – get ready – your pregnancy and maybe even your labor will be much more comfortable. As you might guess – birth balls are not only for birthing. You can use them all through the pregnancy, your labor and postpartum. I should warn you though, your older kids (if you have any) will fight with you over that ball. Why should I use a birthing ball during pregnancy? No pregnant mother will argue the fact, that it is hard to sit when you are pregnant, no matter how comfortable that couch is. Sitting on your birth ball will help to keep your pasture proper. This is especially important in the last weeks of your pregnancy. Whenever your sit – sit on your birthing ball. There are so many benefits of exercising when you are pregnant. It helps you stay fit and healthy, have an easier and faster labor and birth and then to recover much better after the birth. fewer C-sections than the control group of mothers in the study. There were large improvements in childbirth self-efficacy and pain. The study done in Indian hospital found that the practice of birth ball during labor had an effective maternal outcome and that there was no harm to the baby. This study is not directly related to using the birth ball during labor but proves that moving around and being in upright position during labor is significantly helping mother with pain, faster labor, less usage of medical interventions and higher mother’s comfort. Brazilian study with 11 women showed that using a birthing ball and doing other activities such as breathing exercises, massage, baths and vertical positions help mothers control the pain much better. Chinese study with 203 mothers also found that there were statistically and clinically significant differences in back pain level, stress and anxiety levels, as well as pressure level over the lower abdomen before and after the birth ball exercise. Another research says that birth ball (when used every day from 32 weeks) can help the baby to be in the ideal position for birth (Sutton, 1995). There are many ways for you to exercise with your birth ball. Some exercises are good all through the pregnancy and some are more advisable by the end of your pregnancy and during the labor. Please talk and discuss with your health provider to consult which exercises are the safest ones for you. Here are some of most popular exercises with the birthing ball. Put the birth ball against the wall and sit sit on the floor as your press your back against the ball. Breathing is the key to this exercise. So when you exhale, imagine you are forming letter “C” with your spine and still pushing the ball towards the wall. Exhale now. Release the ball from pushing. Do it again. This exercise will make transverse abdominal stronger. Hold the ball towards the wall so you can support it with your lower back. Your hands should be resting on your hips and your feet should be open shoulder-width and little more forward from the wall than your body. As you inhale, bend your knees and try to sit down while rolling down together with your ball behind your back. Do it until your knees are at 90 degrees. Exhale now and stand up. This exercise will massage your back, might open the pelvic area and of course will make your legs stronger (you feel it already, don’t you?). Who said you can’t do hula hoop when you are in labor? Sit down on the ball and position your feet apart as wide as your hips, your knees should be at around 90 degree angle. Your hands should be on your hips. And now imagine you are doing the hula hoop: circle hips to one direction, work your abs and keep your back in one straight position. Now circle your hips the other way. This exercise will help to open the pelvic area during your labor. Position yourself so your back is on the ball and your feet are put firm on the floor. It is a good idea to ask your partner for help to get into this position. Open your body up by putting your head down on the ball, your hands on the floor and your chest will be stretched out. It is like hugging ball exercise, only this time – with your back. When you comfortable in this position try rocking back and forth by bending and straightening your knees. This exercise will massage your back and will stretch your chest. 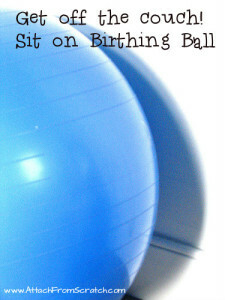 This birthing ball exercise video will teach you few more great exercises with the birth ball. Research shows that you can have shorter labor (by 25-40%) just by being active during labor process: sitting, walking, standing and of course doing exercises with the birth ball. How do I use birthing ball to progress the labor? Yes, you can use birth ball to start labor. To bring baby’s head on your cervix you can do energetic but smooth circles on birth ball. Turn on some music (perhaps salsa) for easier flow and wait for your contractions to begin. After 20 minutes change directions of circles. What are birth ball exercises to help baby “drop”? You can basically do all the other exercises with the birth ball you did during your pregnancy. Here are few moves with the ball to progress labor. 1. Sitting as straight as possible on the ball. 2. Slight bouncing will open up your pelvis and will have more space for the baby to go down. 3. Moving in circles with your ball. Vigorous circles done with ball will bring on contractions. 4. Leaning on the ball will take the pressure of your back and will decrease some pain. Also it makes a good access to your back for some massage which can help with the baby’s positioning too. 5. Using birthing ball to progress labor on the bed may fix baby’s head position. A mother can sit down on the bed with her legs open so the birthing ball can fit between her knees. Mother hugs the ball and leans from side to side. There must be 2 assistants on each side to support mother from falling. There are many ways how you can use your ball after the baby was born. If the ball was THE chair to sit on while you were pregnant, it might be THE chair now too when your perineum is still sore after the birth. Deflate the ball little bit to make it softer. When you get a hang of breastfeeding, sit on the ball while you nurdin your baby. IT will keep your posture straight. Use your birth ball to exercise and get back in shape. If you have a “colicky” baby, the ball will be your best place to sit on. Hold your baby in your/his favorite position and gently bounce on the ball. Or you can even put the baby on the ball (stomach down) and GENTLY bounce. This soft pressure and rhythmic movements will help to sooth the baby. Make sure to keep all safety precautions when using birth ball with the baby. 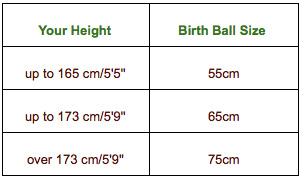 Birth Ball Size Matters! 55cm? 65cm? 75cm? To get the best out of birth ball you need to get the right size. When you sit on the ball and your feet are put flat on the floor, your hips should be slightly higher than your knees. This particular position helps to bring your baby’s weight forward and that gives you less or no back pain and helps you feel more comfortable. 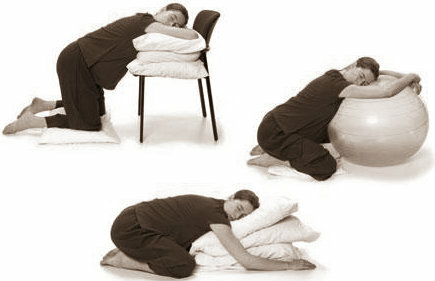 The same position helps a lot through contractions to keep the pain and pressure off your lower back. Should I have a Birthing Ball Cover? 1. If it’s summer, your body is sweaty and hot and sitting on a “naked” birthing ball is not that enjoyable anymore. 2. If you are using your birth ball for many reasons: husband is exercising, you are giving birth on it, children are jumping with it and you are lending to your friend to give birth with. 3. If birthing ball is part of your room decor. 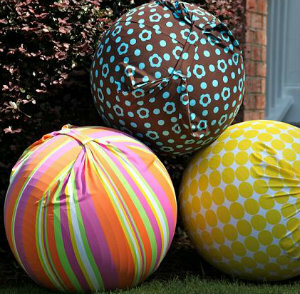 A nice matching birth ball cover will complement your room’s design. 4. If you are a midwife, a doula or a trainer and use birth balls balls often with different women. There are few options you can do to protect and cover your birth ball. Here is a really good and simple tutorial how to make your own birthing ball cover. buy one here or there. Is there birthing ball weight limit? Yes. It depends on the ball. However most of them are up to 250-300kg / 551-661lb. When is the good time to start using the birth ball? You can sit on it as early as you want in your pregnancy. Later on, consult your doctor or midwife about the bouncing part and other specific exercises. Many women start bouncing on the birthing ball when they are 32 week pregnant. Is there a difference between birth ball and exercise ball? Even though most both balls look identical their features might be different. make sure to use a non-bursting birth ball. If it is punctured, the ball should not burst suddenly, but deflate little by little so you can get off the ball safely. stay bare feet when using birthing ball. Less chance to slip/slide. If you do have to wear socks or shoes – make sure they are not slippery. especially in the beginning of using a birthing ball have your partner or doula be there to help you. Start with very simple sitting on the ball to feel comfortable. 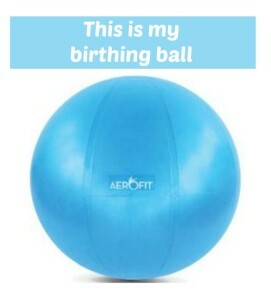 If I still haven’t convinced you to buy a birthing ball – go and sit on one in a gym! You will take one home immediately!